This is actually my favorite fish and this is how I like to have it. Simply clean and slice-into-the-meat and rub a bit salt on it and deep fry. Pomfret is the deep sea fish and the skin is white, the bigger the fish the more expensive. The things I like about this deep fried fish is that I could eat almost everything on their body. All I need is the chili sauce and two plates of steamed rice. 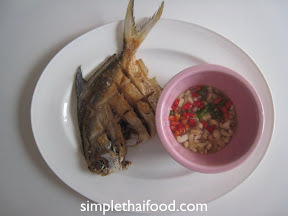 Clean the fish well, take out the stomach and cut on the side and dry well using kitchen paper. Putting some salt on both sides of the fish, so the fish will be crispy after frying and to prevent the fish meat from sticking on the frying pan. Heat up the oil in the wok with medium heat, when the oil is hot add the fish for frying. Fry each side for about 3-5 minute, depending on the fish’s size, or until golden. Turn to the other side until both sides are well fry. 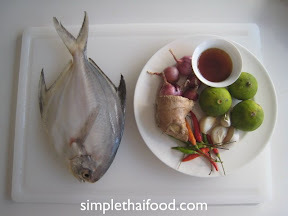 Add all the cut ingredients into a small bowl, follow by the fish Sauce and the lemon Juice, if it is too salty add a bit more lemon juice until you get the sauce as Sour, Salty and Spicy taste you prefer.